This entry was posted in Blogging, Nature and tagged #Green Grasshoppers on June 26, 2018 by Deborah Drucker. You may wonder why I haven’t been writing much lately. I’m still going a little buggy with the genealogical research. Genealogical, that word is a mouthful all by itself. I first thought genealogy should be spelled geneology. I should pronounce it gee-nee-aal-oh-gee but I want to pronounce it gee-nee-all-oh-gee. This is how I think when I have been doing too much research. Talking about bugs, the spittle bugs are back on my rosemary bush. Yippee. Stream of Consciousness Saturday is hosted by Linda G Hill. The word for today is ‘bug.’ Featured image Spittlebug nymph by David Iliff on Wikimedia. This entry was posted in Blogging, Blogging Community, My Life, Nature and tagged #Bugs, #Stream of Consciousness Saturday#Bugs on June 23, 2018 by Deborah Drucker. My Echeveria plant has a hollow space in the center under its leaves but it is not empty inside there. Some birds have chosen to build a nest in the interior. I saw one bird land and hop over to the side of the plant, look around for anyone watching, then hop inside the opening. I am afraid to be seen hanging around near the Echeveria because I worry I will scare the birds away and the nest will be abandoned. Recently made a visit to Joshua Tree National Park, with my daughter, and enjoyed many different views empty of people but not empty of interesting rock formations, Joshua trees, and different varieties of cacti like ocotillo, cholla, and others whose names are unknown to me. The rock formations gave the impression of prehistoric times, cavemen with their blocks of stone, Fred Flintstone at work in his quarry. According to the National Park Service post about the geological formations the stones are monzogranite and were formed over 100 million years ago. Stream of Consciousness Saturday is hosted by Linda G Hill. Prompt for today empty/hollow. This entry was posted in Blogging, Blogging Community, Nature and tagged Stream of Consciousness Saturday on May 18, 2018 by Deborah Drucker. We have a rabbit visitor in our back yard again mooching off our greenery. I completely support his eating the wild grass and Sorrell but I get worried when he starts nibbling on my Wooly Thyme ground cover. I don’t mean to be gruff but it is just starting to come in full and I do not want it trimmed by rabbit teeth. They eat it down to the roots and that’s just not being neighborly in my view. I wanted to catch his photo but I am having a hard time with the new cell phone camera. Not as user-friendly. I consider it user-friendly if I can push a button and it takes the photo. This one is not cooperating with me yet. There were some good shots I missed while I was trying to get it to work. You have to take my word for it but the rabbit was up on his hind legs looking at me who was looking at him with my cell phone. I do have a small bird’s nest inside the Echeverria plant. I think it has 4 small spotted eggs. I confirmed it by peaking inside today but I startled the little chickadee out of the nest. I hope it comes back. Need to steer clear of that plant for a few days. I think the bird was trying to divert my attention from the nest by hopping around the yard tweeting and twittering at me. A good future photo may be of the nest after it’s no longer in use so I don’t caws any more disturbance said the crows. I just checked my cell phone photo gallery and guess what? I did get capture a photo of the rabbit but I wish I could have zoomed in more. Stream of Consciousness Saturday is hosted by Linda G Hill. Today’s prompt: Your Friday prompt for Stream of Consciousness Saturday is “on the farm.” Find a word that has a farm animal sound in it, i.e. sMOOth, and use it in your post. Bonus points if you include three or more. ‘Here Comes Peter Cottontail’ song by Steve Nelson and Jack Rollins. This entry was posted in Blogging, Blogging Community, Nature and tagged Stream of Consciousness Saturday on May 11, 2018 by Deborah Drucker. Amateur backyard birdwatchers my husband and I. We have noticed a little bird on our patio the past couple of days. It seemed pretty bold coming up to perch on our patio table chairs and tweeting its head off at us. It was making quite a ruckus this morning. I may have discovered why. I saw a pair of birds flying back and forth from the large Echeveria plant near the edge of our patio with pieces of wild grass in their beaks. Are they building a nest inside the plant? Is the bird on our patio standing guard? Our little lookout could be a chickadee because he fits the discriptions with a black head. The sound he was making at us was like that warning alarm sound you hear in the last part of the little video above. Why are you sending up the alarm? We were minding our own business inside our kitchen when you happened to spot us. 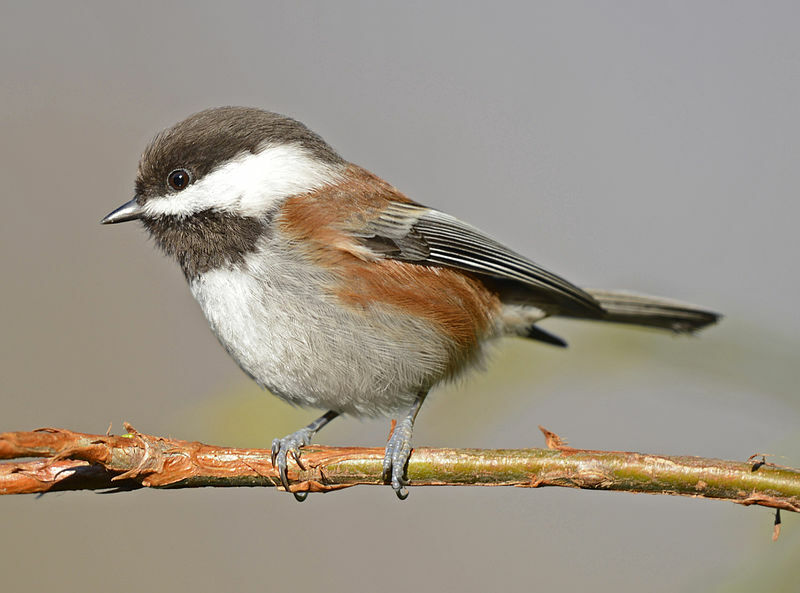 I read that in California you are called the Chestnut-backed Chickadee. Stream of Consciousness Saturday is hosted by Linda G Hill. Today’s prompt is ‘Why/Y.’ Chickadee video by LesleytheBirdNerd on You Tube. This entry was posted in Blogging, Blogging Community, California, Nature and tagged #Chickadees, #Stream of Consciousness Saturday, #Wild birds on April 27, 2018 by Deborah Drucker. I have mentioned my backyard visitor before and how hard it is to capture him/her with my cell phone camera. Usually, it spots me at the window and hops off. But today I was able to get several pretty good photos of the little guy. We had steady rain this morning for over two hours at least, which is great for us in my section of Southern California. I spotted the rabbit taking shelter from the rain under one of our succulent plants. Then after the rain stopped, it came out and munched on the assorted ground cover for a bit. I have seen it hop about 2 feet up to a retaining wall in the yard, but today I have photographic evidence of this ability. This entry was posted in Blogging, California, My Life, Nature and tagged #Rain in California, #Wild rabbits on March 22, 2018 by Deborah Drucker.